Several Australian businesses last week committed to tackling climate change, as the attention turns to next month’s crucial United Nations climate negotiations in Paris. It is a welcome step, because many businesses (and other large organisations) will need to change their behaviour in fundamental ways if the current widespread talk of sustainability is be more than just rhetoric. Many organisations appear to recognise this trend and take pains to advertise their “corporate social responsibility” (CSR) – a catch-all term that can cover a wide range of social, conservation and sustainability initiatives. But has their behaviour really changed? Or is CSR, as some people suggest, often little more than greenwashing – designed to look good while changing little? We attempted to answer this question by looking at two sources that might be more revealing of companies’ true priorities: their corporate mission statements, and their website homepages. Mission statements underpin business planning and usually emerge from intense self-reflection about an organisation’s aspirations. Corporate web pages, in contrast, generally aim to engender confidence in customers, thereby attracting revenue. As such, website homepages can tell you how much organisations really feel they will benefit from having a sustainability message. Our study, published this month in Conservation Biology, looked at 150 of the world’s largest organisations, including resource companies, retailers, government development agencies, conservation groups, and aid organisations. We studied their mission statements and homepages, as well as how their mission statements have changed since the 1990s. Our results show progress, albeit patchy and hesitant. Perhaps surprisingly, the biggest change was among the big miners and oil companies, with a growing number of these resource companies recognising that their mining operations are under threat if they fail to keep local communities happy. While their claims of sustainability remain hard to corroborate, at least more now publicly aspire to greater community concern. The link between sustainable practice and core business aspirations is more distant for retailers – and it shows. Most retailers’ websites are crowded with eyecatching pointers to the latest bargains. No matter that the very cheapness of these products forces producers to cut social and environmental corners, cutting down forests and displacing indigenous people so that German coffee drinkers or US hardware store customers can enjoy lower prices. Curiously, while virtually every commercial organisation we examined does practice some form of CSR, few boast prominently about their achievements. Reports can often be found only by burrowing through the obscure recesses of corporate websites – available to the literati but not too alarming for the investing public. This perhaps calls into question the true strength of their commitment. At least most companies do undertake CSR. While conservation non-government organisations (NGOs) may lobby for it, almost none practice it themselves – at least in a form that could be documented by our study. Curiously, it seems that donors expect such NGOs to be out lobbying or caring for the environment, rather than monitoring their own behaviour. We also found that conservation NGOs’ websites were least likely, of the groups we assessed, to show images of empowered women or to demonstrate other aspirations for gender equity. The dominance of men in positions of power in conservation has been noted in the scientific literature, but it was surprising to find the same trait apparent in websites. Similarly, aid agencies’ websites showed little regard for the environment, despite its critical importance for the world’s poor. Most of their websites tend to concentrate on depicting hardship through a visual code of empty bowls and unhappy women, typically with dark skin. A “donate” button is usually nearby. Percentage of large organisations’ homepages that portray awareness of social responsibility issues (as of August 2014). In fairness, NGOs’ missions statements were generally better than their websites at acknowledging the synergies between social and environmental issues. 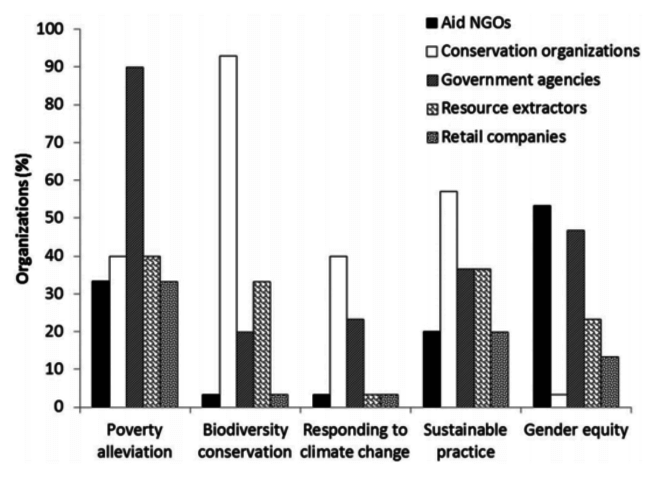 Government agencies, having less urgent need of selling their wares to the public, had the broadest approach, and were more likely than NGOs to acknowledge the wider sustainability agenda. Climate change was a notable omission from the websites and mission statements of almost all the organisations we assessed last August. Though currently more topical, at east for NGOs, perhaps it is usually just too big for any one organisation to contemplate tackling. However, equally likely is the fact that it does not attract donors or investors. Other research suggests that the mere contemplation of climate change is associated with feelings of loss, sadness and hopelessness – the last thing you want sitting next to the donate button on your website. Large organisations think hard about their mission statements and websites. As a result they are faithful reflections of what these groups think their investors and customers will appreciate (or at least not be frightened by). If you want to see whether an organisation is really focused on avoiding harm to society or the environment, you should look critically at these core communications, and, where you can, see how they match up to promises of “corporate social responsibility”.